Alphabet is the New Google…If That Makes Sense – Sundar Pichai is Google’s New CEO! OK, hang with me for a moment as I try to explain what Google’s Larry Page just announced. Through the official Google blog, Larry announced that he (as CEO) and Sergey Brin (as president) are creating a new company called Alphabet. That company, should basically be thought of as you once thought of Google. In fact, Alphabet “will replace Google Inc. as the publicly-traded entity and all shares of Google will automatically convert into the same number of shares of Alphabet.” With me so far? Google is now a company underneath Alphabet, as are Life Sciences, Calico, X lab, Ventures, Capital, and Wing. The new Google is “a bit slimmed down, with the companies that are far afield of our main internet products contained in Alphabet instead.” In other words, Google gets to operate as the internet god, while the rest of Google’s initiatives are fully separate under Alphabet. Still with me? With Page and Brin now running Alphabet, someone needs to take over as the CEO of Google. That man, as you probably guessed, is Sundar Pichai. His growth in the company has been quite impressive and Page had a whole bunch of fantastic things to say about him in the blog post explaining Alphabet. I’ll let you read that all there if you’d like. What does this mean for Android and Chrome? Good question! Neither was mentioned even once in the post, so we are more than likely about to learn all of that over the coming days. Until then, feel free to speculate away. In short, Alphabet is now Google, sort of. Alphabet is a new company that overseas all of Google’s products so that Google itself can get back to focusing on internet. 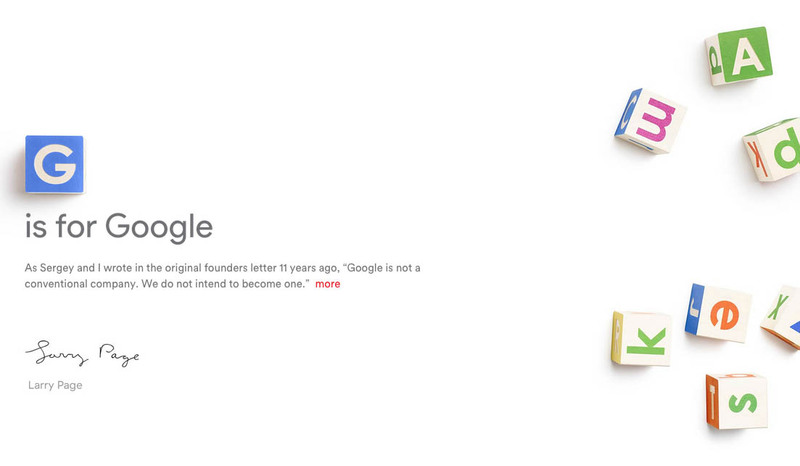 You can visit Alphabet’s site at abc.xyz.